1. 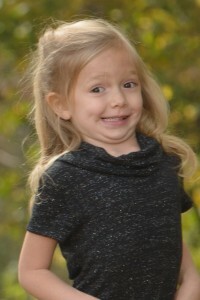 You must have tons of professional portraits of your kids. 2. Your kids must be so easy to photograph. First – have you ever heard the phrase “the cobblers kids have no shoes?” Yes. That pretty much explains things. Yes. They do get far more than the average, but my goal is two mini sessions and one family session each year. Second – the worst. Our kids know how the system works. Make a funny face and that is what you get on the camera. Disaster. And they even get the timing down so that they don’t get caught. Here is an illustration from our family session this last weekend. Yep…that is my kid. Being an Ohio photographer means we get to enjoy amazing fall weather, but it doesn’t guarantee a kid that won’t get goofy in front of the camera. Keep an eye out for the great images from this session it is likely my favorite portrait that I have created of my family but the girls are growing up too fast. Seems like yesterday that we were taking newborn photos – http://wp.me/p2W21I-h9.